Recreational therapists enhance clients' physical, cognitive, and emotional well-being through leisure activities and collaborate with professionals in other allied health departments such as physical therapy, occupational therapy, and speech-language pathology. Along with in-class learning in disability studies and hands-on activities, students get real-life experience working with clients in a variety of settings, engaging in service learning that emphasizes programming and administration, and completing a semester-long internship. A B.S. in Therapeutic Recreation prepares students for the national certification exam, which 100% of IC graduates have passed. A single class session can change a student’s entire life. Just ask Sara Fisher ’14. Fisher entered Ithaca College via the Exploratory Program and signed up for a course called Understanding Disability. A few weeks into the semester, Linda Heyne, a professor in the Department of Recreation and Leisure Studies, visited Fisher’s class to recommend the Introduction to Therapeutic Recreation course she offers to students. The description of the class sparked Fisher’s interest, and she registered for the course the next semester. Fisher, who has two uncles with disabilities, soon discovered her passion for working with the disabled population through recreation. 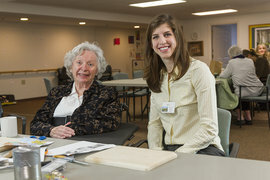 Even before graduating from Ithaca College, Fisher began helping people through IC’s Center for Life Skills, where health science students teach and practice activities of daily living with community members who have experienced neurological damage. At the center, Fisher collaborated with physical therapy, occupational therapy, and speech-language pathology students to create and apply treatment plans for clients. While Fisher values the clinical skills she learned there, the personal relationships really inspired her. In addition to fine motor and planning skills, Fisher’s client also wanted to strengthen her left arm and hand, which had been affected by her stroke. So together they worked on a quilted pillow project to improve those muscles while engaging her creativity. Fisher’s other fieldwork as an IC student included working in behavioral services units, a preschool, and at residential care facilities. After graduation, Fisher landed an internship in Fort Collins, Colorado, working in recreation with people with a range of disabilities, including veterans. She now works in Denver developing recreational and social programs for adults and teenagers, and working with Special Olympics. It could have been intimidating for Fisher to enter the workforce after graduation, but she felt prepared. Outside of class, she also developed skills that transferred to her work environment. In fact, according to Fisher, one of the biggest boosts to her skill development came with a change in lacrosse programs. Fisher’s experience in the Exploratory Program made her aware of some useful advice for current and future students alike: Don’t be afraid to try new things. You might surprise yourself.